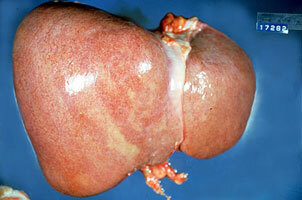 Enlargement of liver beyond its normal size; also known as enlarged liver and liver enlargement. Causes and risk factors: The liver is involved in a multitude of bodily functions and is affected by a variety of conditions, many of which result in hepatomegaly. General classes of causes include infection (viral and bacterial), parasites, malignancy (tumors), anemias, alcoholism, storage diseases, heart failure, congenital heart disease, and metabolic disturbances.